Easily transform plain vanilla ice cream into a sophisticated dessert by adding Grand Marnier and cranberry sauce and spooning it into a chocolate crumb crust. Place pie shells in freezer while preparing filling. For filling, in a large mixing bowl use a large spoon to stir together softened ice cream, cranberry sauce, and Grand Marnier or orange juice until combined. Spoon filling into chilled pie shells. Freeze at least 4 hours or until firm. 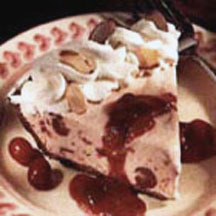 Pipe or dollop whipped topping atop pies and sprinkle with almonds. Cover; return to freezer until serving time*. For easier cutting, remove pie from freezer 5 to 10 minutes before serving. To serve, spoon cranberry sauce over each serving, if desired. Makes 12 servings (2 pies). *Make-Ahead Tip: You may freeze pies wrapped tightly in freezer wrap, for up to 2 months, if desired. To serve, place in refrigerator 10 to 20 minutes before needed. Nutritional Information Per Serving (1/2 of recipe): calories: 345, total fat: 16g, saturated fat: 4g, cholesterol: 20mg, sodium: 232mg, carbohydrate: 49g, fiber: 1g, protein: 3g, vitamin A: 5%, vitamin C: 2%, calcium: 5%, iron: 4%.